The super low profile and ultra-narrow handle of this iron make it easier to get the seam together near the back of the iron. Dual indicator lights show both power-on and heating status. Self-cleaning Teflon coated base and 12′ long SJO cord are standard features. 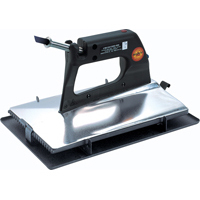 The heavy-duty handle and riveted iron tray provide exceptional durability.